The memento mori quality of the background-photos contextualizes the frantic gameplay and sounds to evoke an interesting emotion. Nice! The easy game play combined with the backgrounds was interesting... I don't know if you intended it this way, but my brain kind of started to put together a narrative with the photographs. It's cool because my brain was on the one hand, trying to figure out what was going on with all the dead people, but then it was also like 'oh yeah! 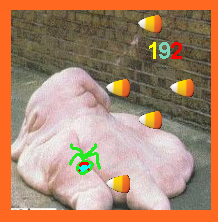 I have to eat all the candy corn!". It reminded me of a tendency that I have to use simple games to distract myself from thinking about serious things in my life. But yeah, it's a neat type of cognitive dissonance that I would like to see in more things. I also really loved the transitions between games. Those photos were too creepy for me!